In the series, Danica McKellar plays the character Winnie Cooper. Danica Mae McKellar was born in La Jolla, California, USA on January 3, 1975. At the age of 10 she had her first appearence on "Twilight Zone". Three years later, she got the role for Winnie Cooper in "The Wonder Years" and became famous with it. After "The Wonder Years", there had been a few parts for her in several movies and series. In addition to her acting, she loved to dance with her sister Crystal in the dancing school their mother owned. In 1998 she achieved the Bachelor Of Science for mathematics at UCLA-University. Today she still lectures at UCLA. Back in 2005 she had a guest-appearance on "How I Met Your Mother". (Here you can find out more about her appearance in "How I Met Your Mother") At the moment she plays a main part in a theatre at the west coast of the USA – the play is called "Proof". 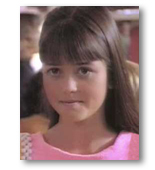 Part in "The Wonder Years"
In the series, Winnie Cooper plays Kevin's long-time girlfriend. Contrary to Kevin, she's a model student, receiving good marks all the time. Winnie and Kevin are friends since they were children, but there are problems in their relationship over and over again. Especially when Winnie grows up and just wants to hang out with the "cool" guys in school, which Kevin doesn't like at all. But both of them always accomplish to get along with each other again. 2005 - How I Met Your Mother"